Am I Too Old to Teach Fly Casting? After teaching fly casting for several years now, I have found that my line of demarcation is about twenty years old. Younger than that and the metaphors that I use to teach fly casting are worthless. It must be a sign of my aging process but I am mystified that those young students who come to me for fly casting instruction just don’t have the worldliness to grasp onto the tools that I have always used to illustrate the dynamics of the cast. When I teach the false cast, I want students to get into a rhythm and to become aware that when casting a shorter length of line, they need to have a quicker casting cycle than they do with a longer length of line. A simple concept but it sometimes needs illustration to be grasped. “But you told me you took music lessons!” Blink, blink. Nothing. When a beginner asks me about casting lessons, I tell them that it is easy to learn the basic cast. Kids pick up on it easier than adults, especially those that have had some musical training, so I always inquire about any music lessons that a prospective student may have taken, yet the wood pyramid with the brass pendulum that graced the piano that every student plunked away at is a foreign concept to younger casting students. They reply that the device used during their lessons was di-gi-tal. Everything that comes out of a teenager’s mouth is said with that odd accent. Everything is di-gi-tal. So, we press on. I need to illustrate that they need to come to a more definitive stop on their forward cast and I ask that they pretend that they are swinging a hammer. The scenario is this: they need to drive a nail into a wall to hang a picture. The Big, Old, Brunette at home always wants pictures hung at eye level so I borrow her advice and tell them that they need to drive the nail into the wall at eye level. Further, they need to swing a hammer big enough to drive the nail in with one stroke. This illustrates that they need to break their wrist at the very last second to apply power at the end of the stroke and come to a complete stop. If they don’t break their wrist ever so slightly, they will be pushing the nail into the wall instead of driving it in. I remind them that when they are swinging a hammer, they do not hold it with a death grip but just tightly enough to keep control. It’s the same way with a fly rod. This analogy works for me and has worked with every student I have ever had that was older than twenty. I was slack-jawed speechless when a casting student told me that neither she nor her brother had ever held a hammer. “Never?” No, was her reply, they always had workmen to do that kind of thing. Now, I am blessed to own a fly shop in a Chicago suburb that is surrounded by economy. This brings new fly fishers into the shop and is an economic boon to me. The downside is that the younger students that I teach come from homes where things are done for them; they have people to do that. She told me not to yell at her, it’s not like her family had a ranch and she had to string barbed wire fences all day. She and her brother lived in Moneyville, for gosh sakes. This was coming from a teenager who drove up to her casting lesson behind the wheel of a new Range Rover with a brush bar on the front. Now it’s my turn to offer up the Owl Look. “Never swung a hammer before have you Punkin?” Pity. Another common casting error that beginners (as well as an old fishing partner) make is to reach back for more power. When executing the back cast, they tend to reach back as if they were making a softball throw which tends to dump their line on the ground and lengthening their casting arc and loosing power instead of gaining power. It typically happens when casting for distance or casting into the wind. The correct technique is to come to a more complete stop on the back cast, let the line unfurl behind you and then apply more power to a complete stop on the forward cast. Left Kreh describes this as an acceleration to a stop. The description works in theory but needs illustration, and my next casting student was a young buck of about nineteen. I took his fly rod away from him, laid it on the ground and told him that the fly rod on the ground is now the painted line on the saloon floor and he would need to step up to the line to throw a dart. I told him that instead of a fly rod in his hand, he now has a “pretend” dart and I asked him to get ready to throw the dart at an imaginary dartboard. This illustration shows that when he is ready to throw the dart, his hand is up by his ear in the position that he should be in if he had made a back cast. Once I asked him to throw the dart, I could show him that the forward stop is at about eye-level. The next teaching step was to move the imaginary dartboard a bit farther across the saloon so that when he makes his next dart throw, he wouldn’t reach back for more power, he needs to come to a harder stop to get the dart to fly farther. The first time I used this analogy, I damn near broke my casting arm patting myself on the back in self-congratulation; I was a genius at getting this point across. From the nineteen year-old I got that Owl Look again, blink, blink. Sometimes I think I am getting too old for this. Joseph Meyer is the owner of the One More Cast Fly Shop in Countryside, Illinois. Previously, he was an instructor for Orvis where he discovered his love of teaching the art of Fly Fishing. 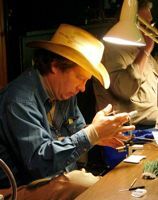 He commercially ties over 600 dozen flies per year and is a Certified Casting Instructor with the Federation of Fly Fishers. He has been published in the Chicago Tribune, American Angler, Yale Anglers’ Journal, Far & Away, and Hatches magazine. “Am I Too Old to Teach Flycasting?” originally appeared in Yale Angler’s Journal. Honored to have been included. Really like your new site and look forward to seeing and learning much more.